The commentary has been authored by a reputed scholar, Pankaj Mishra, who is author of many books, including "From the Ruins of Empire: The Intellectuals Who Remade Asia" and "Temptations of the West: How to be Modern in India, Pakistan, Tibet and Beyond" He is currently a fellow of Britain's Royal Society of Literature. 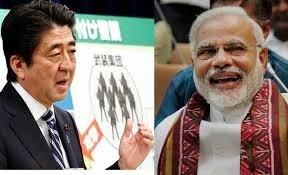 Mishra thinks that it is no compliment that Modi is being hailed at India’s Abe. “The Japanese state’s striking early example of fostering internationally competitive local industries was closely followed by countries such as South Korea and Taiwan”, the commentator says, adding, “Leaders of Malaysia and Indonesia eagerly sought Japanese investment in their economies, primarily to diversify their industrial bases.” They have lost all hope from Japan now. “The most avid of these Asian Japanophiles was Mahathir, the long-lasting prime minister of Malaysia and unabashed exponent of majoritarian nationalism. His own Look East policy was grounded in economic relations with Japan as well as racial and civilizational assertions of difference, and included an explicit anti-Western posture”, Mishra says. “Japan’s comparative advantage couldn’t last, and it didn't. The Asian financial crisis then went on to expose, among other things, the dangerous overreliance on foreign investment of countries like Malaysia. We haven’t heard much about Asian Values since then; those who look east now seek out China rather than Japan”, Mishra underlines. Saying that Modi is only seeking to invoke Asia’s “three outspoken leaders” of the 1980s -- Singapore’s Lee Kuan Yew, Malaysia’s Mahathir Mohamad and Japan’s Shintaro Ishihara – who talked of "Asian salues", Mishra comments, “Lee typically argued that the only antidote to ‘the disruptive individualism of Western liberalism’ was renewed stress on ‘individual subordination to the community’.” This “coincides perfectly with the values cherished by the RSS”. I would and I bet most of us will be ok with "foolish crush" for Japan against China or Pakistan any day.